Department of Environmental Protection (DEP) Acting Commissioner Steven Lawitts and New York City Economic Development Corporation (EDC) President Maria Torres-Springer today announced that work has completed on the construction of approximately 842 specially designed rain gardens in the Brooklyn neighborhoods of Ocean Hill and Brownsville. Each rain garden has the capacity to collect and absorb up to 2,500 gallons of stormwater when it rains. Modeling shows that the 842 rain gardens will capture an estimated 113 million gallons of stormwater each year, subsequently reducing sewer overflows into local waterways, including Paerdegat Basin, Fresh Creek, Hendrix Creek and Betts Creek, and thereby improving the health of the Jamaica Bay watershed. In addition to the rain gardens, 15 stormwater greenstreets were built to better utilize underused roadway areas to absorb stormwater. 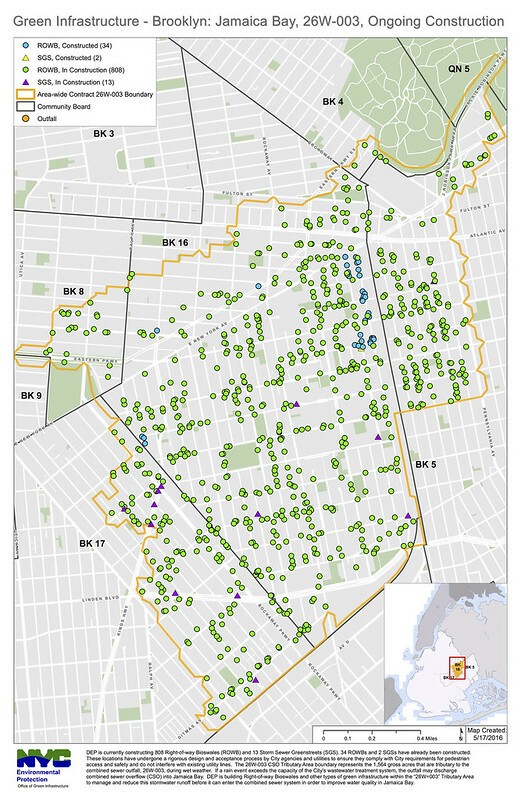 This area of the city, which has been identified by the Department of Parks and Recreation as a Trees for Public Health Neighborhood due to less than average street tree counts and higher than average rates of asthma among young people, will benefit from the addition of the 586 new trees. DEP funded the $35.9 million project and the construction was managed by EDC. To view a video of a rain garden collecting stormwater go here. “NYCEDC is proud to partner with the Department of Environmental Protection on this impactful project. By reducing the risk for flooding, improving the health of Jamaica Bay and beautifying communities, these rain gardens are an asset to Ocean Hill-Brownsville and surrounding neighborhoods,” said NYCEDC President Maria Torres-Springer. “Thanks to the Department of Environmental Protection and the NYC Economic Development Corporation for advancing the development of green infrastructure in our city. The completion of more than 800 rain gardens in Ocean Hill and Brownsville indicates the scale of the work underway to protect our city's waterways, contribute to sustainability, and beautify our city. These kinds of commonsense, win-win solutions are what building up our green infrastructure is all about. I look forward to further steps to upgrade our infrastructure for the next generation of New Yorkers,” said State Senator Jesse Hamilton. “We live in a large and growing metropolis and as such it is critically important that our infrastructure reflects the growth of the outer boroughs and the city as a whole. As climate change becomes more of a reality with each passing day, important environmental designs, such as rain gardens, contribute to making New York City greener and is a simple step that will have major benefits in our efforts to combat climate change. I applaud EDC and DEP for their work to improve the health of Jamaica Bay and stormwater retention,” said Council Member Rafael L. Espinal, Jr.
“East Brooklyn BID appreciates the sensitivity that DEP administered with the rollout of the rain gardens in the industrial park and surrounding communities. It was prudent for the installations not to interfere with business operations and, in numerous locations, we were able to come up with alternate solutions as to not to impair business functions. This methodology between city agencies, community-based organizations and local stakeholders needs to be the blueprint going forward with other projects,” said East Brooklyn Business Improvement District Manager William Wilkins. Rain gardens are built in city sidewalks and do not result in the loss of any parking spaces. They resemble standard street tree pits, except that they vary in size, have curb cuts that allow stormwater to enter and overflow if it becomes saturated, and have been designed in a way that will allow them to manage up to 2,500 gallons each during a storm. DEP has developed standard designs, specifications and procedures for building green infrastructure in the streets and sidewalks of New York City. In partnership with the Departments of Transportation and Parks and Recreation, DEP conducts an extensive site selection process that includes geotechnical investigations and surveys. During construction, the rain gardens are excavated to a depth of five feet and are then backfilled with layers of stone and engineered soil. These layers contain void spaces that store the stormwater and promote infiltration. The addition of hardy plants further encourages infiltration through root growth and increases the capacity of the rain garden through evapotranspiration. The rain gardens are designed so that all the stormwater is absorbed in less than 48 hours and dedicated maintenance crews ensure that they are functioning properly, including removing any trash that may have accumulated and pruning the trees and plants. The crews are active seven days a week, visit each rain garden approximately once a week and additional crews will continue to be added as the program expands. To date, approximately 1,000 rain gardens have been built throughout New York City with 1,500 currently under construction and thousands more planned for the next several years. DEP has conducted extensive outreach in the Jamaica Bay watershed area, including meeting with elected officials, Community Boards 3, 5, 8, 16 and 17, and the East Brooklyn Business Improvement District, as well as numerous other neighborhood and environmental organizations. These meetings help to inform communities about the purpose of green infrastructure and the benefits it will bring to their neighborhoods, as well as plans for future construction. In addition, brochures with Frequently Asked Questions are distributed to the properties abutting the locations of future rain gardens. New York City, like other older urban communities, is largely serviced by a combined sewer system where stormwater that falls on roofs, streets, and sidewalks, and wastewater from homes and businesses are carried through a single sewer line to treatment plants. The city’s 14 treatment plants can manage and treat to federal Clean Water Act standards all the wastewater created in New York City on a dry weather day, or about 1.3 billion gallons on average. On a rainy day they have the capacity to clean more than twice the dry weather flows. However, during intense precipitation events, the stormwater that falls on the city’s impervious surfaces exceeds that capacity and overflows can be discharged into local waterways. If the overflows were not discharged, the City’s treatment plants would be flooded and severely damaged and wastewater could backup into homes and businesses. Over the last decade the City has invested more than $10 billion in upgrades to wastewater treatment plants and related efforts to reduce combined sewer overflows and testing confirms that the water in New York Harbor is cleaner today than it has been in more than a century. However, overflows remain the city’s primary harbor water quality challenge. As traditional “grey” infrastructure upgrades became increasingly expensive, the NYC Green Infrastructure Plan was launched. An alternative approach to improving harbor water quality, it combines traditional infrastructure upgrades and the integration of green infrastructure to capture and retain stormwater runoff before it can ever enter the sewer system and contribute to overflows. New York City and New York State have entered into a Modified Consent Order which formalized the City’s inclusion of green infrastructure as an important component of its plan to reduce combined sewer overflows into local waterways and improve the ecological health and cleanliness of New York City harbor water. DEP manages New York City’s water supply, providing more than one billion gallons of water each day to more than nine million residents, including eight million in New York City. The water is delivered from a watershed that extends more than 125 miles from the city, comprising 19 reservoirs and three controlled lakes. Approximately 7,000 miles of water mains, tunnels and aqueducts bring water to homes and businesses throughout the five boroughs, and 7,500 miles of sewer lines and 96 pump stations take wastewater to 14 in-city treatment plants. DEP has nearly 6,000 employees, including almost 1,000 in the upstate watershed. In addition, DEP has a robust capital program, with a planned $14 billion in investments over the next 10 years that will create up to 3,000 construction-related jobs per year. For more information, visit nyc.gov/dep, like us on Facebook, or follow us on Twitter. New York City Economic Development Corporation is the City’s primary vehicle for promoting economic growth in each of the five boroughs. NYCEDC’s mission is to stimulate growth through expansion and redevelopment programs that encourage investment, generate prosperity and strengthen the City’s competitive position. NYCEDC serves as an advocate to the business community by building relationships with companies that allow them to take advantage of New York City's many opportunities. Find us on Facebook or follow us on Twitter, or visit our blog to learn more about NYCEDC projects and initiatives.